Auction Terms & ConditionsTERMS & CONDITIONS Items are sold "AS IS", "WHERE IS" with no guarantees of any kind (except for the authenticity of the coins). Grading: Every person has their own opinion. It is the responsibility of the buyer to examine and grade to their own satisfaction before they bid. ABSOLUTELY NO COIN RETURNS ON THE BASIS OF GRADE. Buyers shall rely entirely on their own inspection and information. Our estimates are values taken from the lastest "Coin World" trends based on t he grade listed of a coin. This value/estimate is not an inducement to bid this amount. Bid the amount you wish. If you have questions or concerns about any coin, call us before you bid. Returns: Internet buyers are entitled to a return within 3 days of receipt of items. In order to return an item, we must be notified of your intent to return within that 3 day period. We can be reached at 214-232-7437. Items returned will be shipped at buyers expense. All returns are subject to a restocking fee of 15% of the purchase price with a minimum charge of $10. Shipping charges are not refundable. Items must be returned in the same holder and condition as they were sold to qualify for refund. Bidders are responsible for knowing which item they are bidding on. Bidder should inquire with the ring person or decline to bid if they are unsure of what they are bidding on. Once you have won the bid you have effected a contract and will be expected to pay for the item. The auctioneer reserves the right to accept bids in any increment he feels is in the best interests of his clients, the seller. Contested bids will be opened back up to the last two bidders. All announcements made on the day of the sale take precedence over printed matter. Auctioneer reserves the right to hold personal checks & coins until the check clears. Buyer will pay for postage & insurance when coins are shipped. 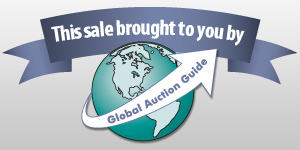 CCandJJ is providing Internet pre-auction as a service to Bidder. Bidder acknowledges and understands that this service may or may not function correctly the day of the auction. Under no circumstances shall Bidder have any kind of claim against CCandJJ or anyone else if the Internet service fails to work correctly before or during the live auction. CCandJJ will not be responsible for any missed bids from any source. Internet bidders who desire to make certain their bid is acknowledged should use the proxy-bidding feature and leave their maximum bid 24 hours before the auction begins. CCandJJ reserves the right to withdraw or re-catalog items in this auction. CCandJJ are not engaged in active bid calling, this is done by the software auction platform.PAYMENT INSTRUCTIONS Visa, Mastercard, American Express & Discover Card payments: Call 214.232.7437Monday - Friday 8:00 - 4:30 cst. Checks (must clear prior to shipping) & Money Order payments: Mail to: CCandJJ 990 Highway 287 NSuite 106-182Mansfield, TX 76063 SHIPPING INFO Auction lots will be shipped via US Mail within two business days upon receipt of payment or check clearance. Texas Customers are Subjected to Texas Taxation Laws. Announcement:Information contained herein is presented on behalf of the seller. Christy's Collectibles and Jason's Junk, agent for the seller, cannot guarantee the information to be correct or assume the liabilities for errors and omissions. All lines drawn on maps are approximate. Buyers should verify the information to their own satisfaction. Any announcements made from the auction block on day of auction will take precedence over any matter of print and will be final.